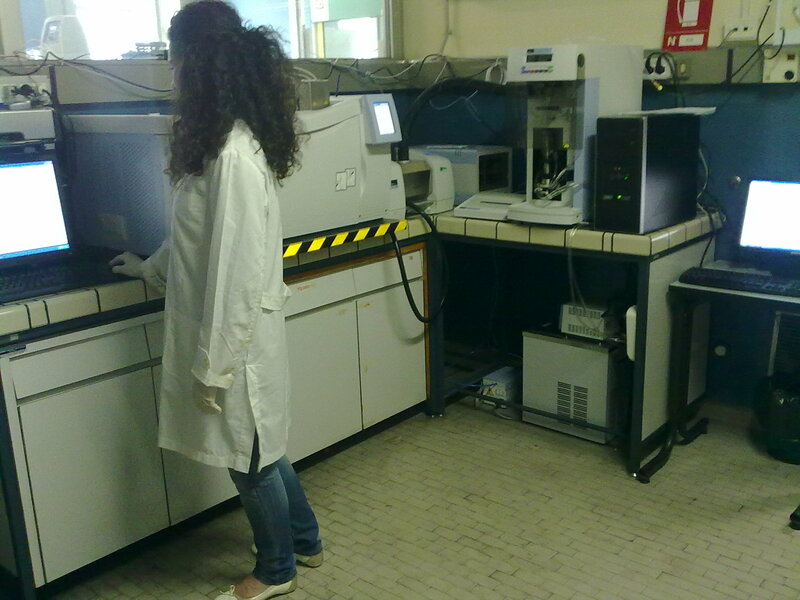 TGA-FTIR-GCMS | Centro Interdipartimentale per lo Studio degli Amianti e di altri Particolati Nocivi "Giovanni Scansetti"
The non-conventional high-sensitive thermogravimetric analyzer (TGA), in-line coupled with an infrared and a mass spectroscope (FTIR, MS) and a gas chromatograph (GC), all from Perkin Elmer, enables to achieve exhaustive and complementary information about the amount and nature of gas evolved during thermogravimetric analysis. The simultaneous measurements FTIR-GCMS are obtained by a propietary interface (Trlogy, from Red Shift) with a pressurized and heated (up to 350 °C) transfer line. The high sensitivity ultra-microbalance TGA (Pyris 1), sensitivity: 0.1 μg, works in a temperature range from ambient to 1000 °C, with standard furnace, and from 50 to 1500°C with the high temperature furnace. The installed furnace chiller allows operation from sub-ambient temperature (-20 °C) and enables measurement also of ultra-volatile gases adsorbed on particle surface. The Gas Chromatograph/Mass Spectrometer (Clarus® 560 S/500S) delivers high-sensitivity analyses through a combination of state-of the-art electronics and ion optics, the widest mass range (1-1200 u.a) and high scanning rates. The MS may acquire spectra in full scan mode or in Selected Ion Monitoring (SIM). The GC is equipped with a nonpolar fused silica capillary column (DB5 MS) coated with a 5% diphenyl-dimethylpolysiloxane stationary phase. TGA Design: A vertical design with a high sensitivity balance and quick response furnace. The balance is located above the furnace and is thermally isolated from it. A precision hang-down wire is suspended from the balance down into the furnace. At the end of the hang-down wire is the sample pan. The sample pan’s position is reproducible.